Citation: Danielyan KE, Vardanyan R, Paronyan ZK, et al. PRPS-1 is a regulative for neuroprotection and cells regenerative proliferation. J Biomol Biochem 2018;2(2):6-10. Background: Phosphoribosylpyrophosphate synthetase-1 (PRPS-1; EC 2.7.6.1) is the widely distributed in the human tissues and serves as a regulative key enzyme for purine metabolism, whereas Xanthine Oxidoreductase (XOR; EC 1.1.3.22) is the enzyme responsible for the catabolism of purine nucleotides and might by feed-back mechanism coordinate this entire biochemical pathway. We proposed activation of PRPS-1 and simultaneous inhibition of XOR might initiate regenerative processes after stroke. Methods: We used hydrogen peroxide intracranial injection (3%) as the model for ROS generation phase of stroke development. XOR activity was measured by evaluation of uric acid formation. PRPS-1 was measured by the kit (Novocib, France). Blood Brain Barrier integrity was evaluated by utility of Evans Blue. KI-67 was used for detection of cells proliferation. ANOVA one-way analysis was used for evaluation of statistical significance of the results. Pearson coefficient was calculated for delineation of the correlation of XOR and PRPS-1 dynamic changes of activities. Results: PRPS-1 activity after stroke in rats was stimulated by phosphates (control; 1.9145 ± 0.0400 vs phosphates treatment 6.6304 ± 0.0500 vs allopurinol treatment 1.6921 ± 0.0359, p<0.05). In phosphate treated group in comparison with the control XOR activity was lower (control; blank - 0.6406 ± 0.0378; substrate - 0.8513 ± 0.1527; phosphate treatment group blank - 0.2500 ± 7.5758e-3 vs substrate 0.3314 ± 0.0625; allopurinol treated group: blank - 0.5549 ± 8.1301e-3 vs substrate 0.5786 ± 0.017). 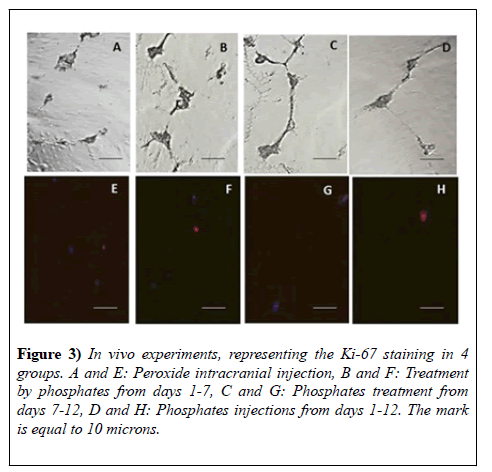 Ki-67 incorporation was more pronounced in phosphate treated group in comparison with the control. BBB disruption was less in experimental vs control groups. Conclusion: Phosphates are proposed to be used as the post stroke regenerative agents. Phosphoribosylpyrophosphate synthetase-1 (PRPS-1; EC 2.7.6.1) catalyzes the phosphoribosylation of ribose 5-phosphate to 5- phosphoribosyl-1-pyrophosphate, which is necessary for the salvage pathways of purine and pyrimidine, pyridine nucleotide cofactors NAD and NADP, the amino acids histidine and tryptophan biosynthesis [1,2]. Three PRPS genes have been identified: the widely expressed are PRPS1 and PRPS2 genes, and PRPS3, which is predominantly transcribed only in testis . Most PRSPs belong to class I, which require Mg2+ and phosphate for enzymatic activity, but can be inhibited allosterically by ADP and possibly other nucleotides [4-11]. Class II PRSs are found specifically in plants which are not dependent on phosphate for activity and lack an allosteric site for ADP [12,13] While class I PRSs transfer the diphosphoryl group only from ATP or dATP to ribose 5-phosphate [5,7], class II PRSPs have a much broader specificity for a diphosphoryl donor, including ATP, dATP, UTP, CTP and GTP [13,14]. Recently, a novel class III PRS has been identified from Methanocaldococcus jannaschii which is activated by phosphate and uses ATP and dATP as a diphosphoryl donor, but also lacks an allosteric site for ADP . Phosphate has multiple effects on the activity and structure of the enzyme. It usually acts as an activator for the activity of bacterial and mammalian PRSPs although SO42- can mimic the effect of phosphate at approx. 10-fold higher concentrations [4,7,10,14,16]. In patients with PRPS super activity, Roessler et al. [17,18] and Becker et al. identified mutations in the PRPS-1 gene. All patients except 1 had hyperuricemia, neurodevelopmental abnormalities, and sensorineural deafness; the other patient had only hyperuricemia and gout. Functional expression studies of all mutations showed that enzyme over activity were due to alteration of allosteric feedback mechanisms. Thus, abnormalities in synthesis of purines might influence on the catabolism of them and induce hyperuricemia and gout. Xanthine Oxidoredictase (XOR; EC. 1.1.3.22) is another key and primer enzyme responsible for the formation of the uric acid from xanthine and hypoxanthine. In our previous publications we stated that regulation of XOR might have an impact on the entire catabolism of the purines . By the utility of XOR inhibitors we demonstrated in our experiments that inhibition of this enzyme might trigger cells genesis in vitro [21-23]. Our current investigations are devoted to the delineation of XOR interactive with PRPS-1 roles in the processes of cells proliferation, protection in peroxide dependent brain injury. We also monitored the activity changes, the impact of activators and inhibitors of these enzymes during development of the pathology. For the entire in vivo study it was used 70 animals. The all experimental procedures were approved by Ethical Committee of the Institute of Biochemistry, National Academy of Science of Armenia. The animals were anesthetized by administration of pentobarbital 10 mg/100 mg of weigh kg, injected I.P using a hypodermic needle. During surgery cranial and rectal temperature continuously were controlled as these parameters reflecting the normal animal physiological state. The body as well as cranial temperatures was sustained for 36.6°C. The hair layer of the white laboratory rats head was removed and the skin before the incision was cleaned with ethanol. The rats were placed in a stereotaxic frame (Poland), and a specially fabricated 27-gauge stainless steel cannula with 30° bevel was introduced after limited craniotomy through a burr hole into the midcerebral cortex. Hydrogen peroxide after limited craniotomy was injected into the brain parenchyma by the following coordinates from bregma: 2 mm lateral to midline, 3 mm anterior to the coronal suture, and 2 mm below the surface of the skull (4 mm lateral to midline, 2 mm anterior to the coronal suture, and 3 mm below the surface of the skull). The volume of injected solution was equal to the 5 μl (3% of hydrogen peroxide). After infusion, the injection syringe cannula was left in the brain parenchyma for a minutes and then removed slowly. After all the burr hole was covered with the bone wax and the incision was closed. Animals were placed into the cages with the free access for water and food. The hole in the scalp was covered by the paraform based covering gel. Twelve days later animals were decapitated after intra cardiac perfusion with Saline. Allopurinol as well as Phosphates treated groups was divided into the 3 subgroups: treatment from days 1-7, 7-12, and 1-12. Activator of PRPS 1, phosphate was delivered into the animals’ organism by drinking water as the 4% solution. Eight days later after hydrogen intracranial injection the rats were anesthetized and it was injected into the 4th ventricle anti Ki-67 induced antibodies (Ki-67 monoclonal antibody (2aj1), APC, eBioscience, Austria). The tissue was dissected from the dentate gyrus of the hippocampus and from the sub ventricular zone of the lateral ventricle, after all it was made cells suspension and investigated by fluorescent microscope with Texas Red matching filter system (633 nm excitation and 660 nm emission, Leica TCS SP8). The penetration of the antibodies was initiated by triton X 100. Consequently we were not expecting bright visualization of Ki-67. The damaged with hydrogen peroxide zone of the brain was separated, homogenized with the phosphate buffer (1x) with the added Triton X 100 (0.1%). The supernatant after 15 minutes of centrifugation at G=3000 was collected for further enzyme activity measurement. The activity of PRPS-1 was estimated by the kit, purchased from Novocib, France. The main idea of the kit is estimation of the PRPS-1 activity by the Mg2+ ions in the presence of the Ribose-5-phosphate with the following formation of the PRPP. In the presence of Hypoxanthine (Hx), PRPP is converted to IMP (Inosine Monophosphate) by Hypoxanthineguanine phosphoribosyltransferase (HGPRT). IMPD (Inosine Monophosphate Dehydrogenase) is immediately oxidized by a highly active IMPDH in the presence of NAD with simultaneous formation of NADH2 directly monitored spectrophotometrically at 340 nm. Estimation was performed by the determination of the uric acid quantity in the brain tissue. All reagents are purchased from Sigma. The damaged with hydrogen peroxide zone of the brain was separated, homogenized with the phosphate buffer (1x) with the added Triton X 100 (0.1%). The supernatant after 15 minutes of centrifugation at G=3000 was collected for further enzyme activity measurement. The final volume of the solution mixture was equal to 1 ml. Xanthine (0.06 μg/ml) and XOR inhibitor allopurinol were applied in the equal quantities. Incubation of the samples, covered to prevent evaporation, was performed for 40 minutes at 36.6°C to 36.7°C. The final samples were centrifuged for 5 minutes at G=15000. Formation of the tungsten blue was estimated by the utility of Cary 60 (Agilen Technologies, USA) by the utility of wavelength 660 nm . Based on the Bradford analysis it was calculated the total used proteins quantity, which was normalized to 1 m of the protein for specific enzyme activity calculation. Animals were injected intravenously with 1 ml of 4% Evans Blue in Saline solution. After one hour of circulation the rats were intracardially perfused with saline and the brains were removed. The brains were cut into the slices with 1 mm thickness and the damaged zone was separated. Evans blue quantity was determined spectrophotometrically (Agilent Technologies, Cary 60 UV/VIS, USA) at λ=550 nm . In our calculations we have used t-test (student) for pair comparison as well as ONE-WAY-ANOVA for the calculation of the significance of the comparable all groups. The results were considered statistically significant when p was lower or equal to 0.05. Pearson coefficient was use to delineate the significance of XOR and PRPS-1 correlations. To be able to evaluate the activities of XOR as well as PRPS-1 in the conditions of pathology, first, we needed to clarify the activities of the same enzymes in the brain of intact animals. To evaluate also interaction of these enzymes we have used also the inhibitors of them and analyzed in cross interfering ways: influence of XOR inhibitor on PRPS-1 and PRPS-1 inhibitor on XOR. In comparison with the blank-control (0.0673 ± 3.5607e-3), addition of the xanthine significantly was elevating the activity of the enzyme (0.0988 ± 0.0156, p<0.05), whereas the inhibitor of XOR was diminishing that activity (0.078 ± 0.028). Inhibitor of PRPS-1 - GTP was activating activity of XOR in the statistically significant way (0.1863 ± 0.0296), (Figure 1B). Interestingly, inhibitors of XOR as well as GTP are inhibiting the activity of PRPS-1 in the statistically significant (3.3854 ± 0.0617; 0.8542 ± 0.0265; 0.6536 ± 0.4311) (Figure 1A). Figure 1: Activities of XOR and PRPS in the intact animal’s brains. A: PRPS activity, B: XOR activity. The experiments were performed with the utility of spectrophotometer Cary 60 UV/VIS, Agilent (USA). The absorption of the light was evaluated with the utility of 660 nm of the wavelength for XOR activity determination and 340 nm for PRPS. It was used t-test for delineation of statistical significance of the experimental results (results were accepted as statistically significant, when p<0.05). N of the animals in the groups were varying from 4-6. The animals were divided into 3 groups: control animals, which were intraperitonially injected with Saline; animals, which with the drinking water were obtaining the phosphates and the animals, which with drinking water were receiving allopurinol. The part of the animals were intracardially perfused with saline and decapitated after a day after intracranial injection, the second part of the animals were decapitated during the 7th day and the final group of the animals - during the 12th day (Figure 2). 1. In peroxide treated as well as phosphate groups it is notable negative correlation of XOR and PRPS1 activities (-0.63459; -0.1907 - Pearson coefficient). 2. In allopurinol treated groups during time it is notable positive correlation with the slight XOR increase and dramatic PRPS 1 activities elevations (0.466748). Figure 2:Specific Activities of XOR and PRPS-1 in the peroxide injected animals’ brains. A: Correlative activities of XOR and PRPS for control group,B: Correlative activities of XOR and PRPS-1 for phosphates treated group, C: Correlative activities of XOR and PRPS-1 for Allopurinol treated group. The experiments were performed with the utility of spectrophotometer Cary 60 UV/VIS, Agilent (USA). The absorption of the light was evaluated with the utility of 660 nm of the wavelength for XOR activity determination and 340 nm for PRPS-1. It was used ONE-WAY-ANOVA, t-test for delineation of statistical significance of the experimental results for all type of the investigations. N of the animals in the groups were varying from 4-6. Correlation of XOR and PRPS-1 for peroxide group from day 1-12th: The correlational activities of XOR and PRPS-1 after day 1 after intracranial injection of hydrogen peroxide were negative to each other. For XOR the specific activity was equal to 0.5618 ± 0.0264 - day 1, 0.0568 ± 0.0752 - day 7th, 0.8513 ± 0.1527 - day 12th, whereas for PRPS-1 to 0.5702 ± 0.0264 - day 1, 3.2992 ± 0.0752 - day 7th; 1.9145 ± 8.2291e-4 - day 12th (Pearson coefficient: -0.63459) (Figure 2A). Correlation of XOR and PRPS-1 for phosphate treated animals group from day 1-12th: For XOR it was equal to 0.5186 ± 0.0152 - day 1st; 0.2077 ± 0.2077 - day 7th; 0.3314 ± 0.0625 - day 12th, whereas for PRPS-1 0.3366 ± 8.0000e-3 - day 1st; 0.8566 ± 0.1347 - day 7th; 6.6304 ± 7.7403e-4 - day 12th (Pearson coefficient: -0.1907) (Figure 2B). Correlation of XOR and PRPS-1 for allopurinol treated animals group from day 1-12th: For XOR it was equal to 0.7556 ± 9.4159e-3- day 1st; 0.0432 ± 0.0315 - day 7th; 0.5786 ± 0.0176- day 12th, whereas for PRPS-1 - 0.2533 ± 0.0140- day 1st; 1.1167 ± 4.0000e-3- day 7th; 4.8891 ± 8.2960e-3- day 12th (Pearson coefficient: 0.466748) (Figure 2C). Influence of the inhibitors on the activities of XOR and PRPS-1 on day 12th. XOR activities on day 12th for 3 different groups were the following: 0.6406 ± 0.0378- blank; 0.8513 ± 0.1527-xanthine; 0.8115 ± 0.0887- GTP - for peroxide group; 0.2500 ± 7.5758e-3-blank; 0.3314 ± 0.0625- xanthine; 0.2997 ± 0.0412 - GTP. PRPS-1 activity on day 12th for 3 different groups were the following: 1.9145 ± 8.2291e-4 - ribose-5- phosphate; 1.5629 ± 2.0573e-4-allopurinol - for control group;6.6304 ± 7.7403e-4 - ribose-5-phosphate; 0.9343 ± 3.4832e-3 - allopurinol - for phophate treated group; 1.6921 ± 3.5949e-3 - ribose-5-phosphate; 4.9132 ± 3.5949e-3- allopurinol - for allopurinol treated group (results of the comparison of all groups in XOR study are statistically significant, p<0.05 (ONE-WAY-ANOVA); statistically significant also the results within all 3 groups in PRPS-1. Ki-67 was injected into the 4th ventricle and the integration of the marker was visualized after 12 days of the time period. We have dissected the tissue from the dentate gyrus of the hippocampus and from the sub ventricular zone of the lateral ventricle, made cells suspension and investigated by fluorescent microscope with Texas Red matching filter system (excitation 633-647 and emission=660 nm). On the Figure 3 there are presented the contrast phase as well we fluorescence microscopy pictures of 4 groups: control animals with 3% hydrogen peroxide injection (Figure 3A and 3E), impaired animals treated with phosphates from days 1-7 (Figure 3B and 3F), 7-12 (Figure 3C and 3G) and 1-12 (Figure 3D and 3H). The survival of the animals in the group of the animals treated with phosphates from day 1-12 was lower (results are not presented). From 5000 cells the higher amount of red colored cells were visualized in the group of the animals treated from days 1-7 (Study, p<0.05, t-test) (Figure 3). The brains of the animals after saline based perfusion was divided into the two parts: ipsilateral and contralateral. At the final step of our experiments we had two groups of the animals: control, which represent the injection of hydrogen peroxide into the animals brains and intraperitoneal injection of the Saline and phosphate treated animals group, which was the best from the stand of survival point as well as based on the quantitative evaluation of the Ki-67 stained cells. In comparison with the control group phosphate treatment was protective and in the statistically significant way was diminishing the extravasation of Evan Blue into the brain parenchyma in ipsilateral and contralateral for injection hemispheres (0.1318 ± 5.6238e-3; 0.0728 ± 0.019 -control, 0.0144 ± 1.1314e-3 and 8.0500e-3 ± 1.7678e- 1-7 days phosphate treated group of the animals, 0.0852 ± 2.4749e-4 0.0319 ± 3.5355e-4 - 7-12 days phosphate treated group of the animals, 0.0606 ± 6.2241e-4; 0.0305 ± 1.9221e-3 - 1-12 days phosphate treated group of the animals), (n=6 in each group), p<0.05 in the group) (Figure 4). 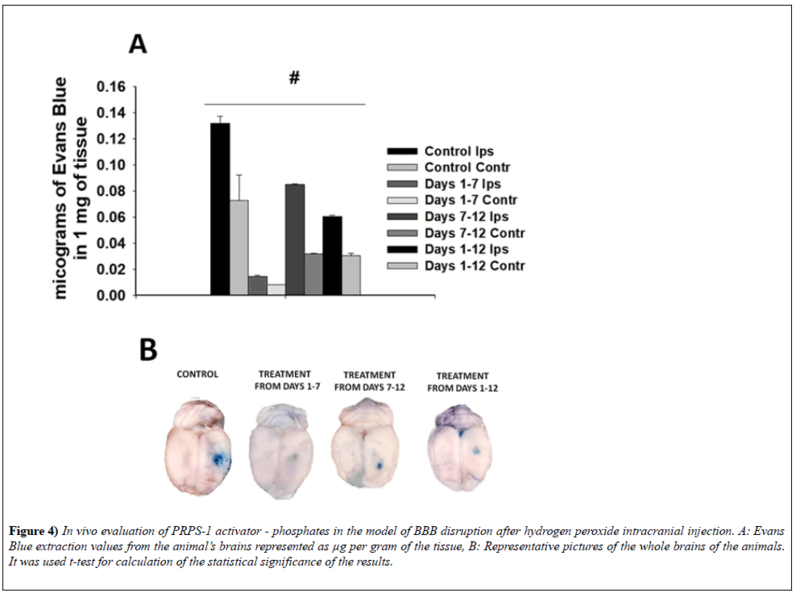 Figure 4:In vivo evaluation of PRPS-1 activator - phosphates in the model of BBB disruption after hydrogen peroxide intracranial injection. A: Evans Blue extraction values from the animal’s brains represented as µg per gram of the tissue, B: Representative pictures of the whole brains of the animals. It was used t-test for calculation of the statistical significance of the results. In accordance with the literature data, allopurinol inhibits the enzyme XOR, thereby blocking the conversion of the oxypurines hypoxanthine and xanthine to uric acid. Allopurinol administration also leads to deceleration of the rate of de novo synthesis of purine nucleotides . However, to clarify the behavior of the XOR and PRPS-1 enzymes in the pathological conditions, first, we needed to evaluate their activities in the brain of intact animals. The activity of the PRPS-1 was diminished in the presence of GTP as well as allopurinol, which means that purines catabolism inhibition by feed-back mechanism might inhibit also the activity of PRPS-1. Interestingly, XOR activity was inhibited by GTP, which might be explained or as the influence of key regulative enzyme PRPS-1 impact on XOR activity or overwhelming concentration of energetic source - GTP. After comparison of the dynamic changes of XOR and PRPS-1 activities in 3 groups: peroxide intracranial injected animals serving as the control group; phosphate treated animals; allopurinol treated animals, we concluded, that phosphates have positive influence, activating PRPS-1 and meanwhile inhibiting XOR. In peroxide treated as well as phosphate groups it is notable negative correlation of XOR and PRPS-1 activities. Strong, over activation of the PRPS-1 and simultaneous inhibition of XOR might trigger of purine and pyrimidine nucleotides source generation, which in turn might stimulate cells proliferation. In allopurinol treated animals group the negative correlation is not notable. In contrast to the intact animals’ brain tissue, GTP didn’t activate XOR in pathological condition; exception is the allopurinol treated animals group. Allopurinol after modifications in the organism might by itself possess with the high absorption in the conditions of very low baseline XOR activity. It might be explained due to the formation of Xanthine Oxidase from Xanthine Dehydrogenase via limited proteolysis, because XOR is the dual enzyme and in pathological conditions act mostly as the oxidase. Allopurinol in hydrogen peroxide treated animals brain tissue was inhibiting activity of PRPS-1; exception is the allopurinol treated animals group. In pathological conditions, we might assume, that PRPS-1 might be structurally changed and behave not as in normal, physiological conditions. After Ki-67 staining, we concluded that the best time point to trigger cells proliferation are days 1-7. The staining is not too bright, because in vivo conditions we are not able to use pore formatting agents such as Triton X and can only have visualized weak nuclear or perinuclear staining. The best treatment conditions were used also for another in vivo set of the experiments. Phosphates as proved by experiments after 1-7, 1-12 days of treatment might efficiently prevent partially BBB disruption. Thus, we concluded that activation of PRPS-1, inhibition of XOR during early stage of pathology development might trigger regenerative cells proliferation as well as prevent BBB disruption. The work was made possible because of ANSEF biochem-4414 award (PI: Kristine Danielyan). We are thankful to the center of Human Genetics, Armenia, for collaboration and technical support in the study with Ki-67 visualization. Hove-Jensen B. Mutation in the phosphoribosylpyrophosphate synthetase gene (prs) that results in simultaneous requirements for purine and pyrimidine nucleosides, nicotinamide nucleotide, histidine and tryptophan in Escherichia coli. J Bacteriol 1988;170:1148-52. Hove-Jensen B. Phosphoribosylpyrophosphate (PRPP)-less mutants of Escherichia coli. Mol Microbiol 1989;3:1487-92. Becker MA. Hyperuricemia and Gout. In: Scriver CR, Beaudet AL, Sly WS, Valle D (eds.) :The Metabolic and Molecular Bases of Inherited Disease. New York: McGraw-Hill 2001. Switzer RL. Regulation and mechanism of phosphoribosylpyrophosphate synthetase: Purification and properties of the enzyme from Salmonella typhimurium. J Biol Chem 1969;244:2854-63. Fox IH, Kelley WN. Human phosphoribosylpyrophosphate synthetase: Distribution, purification, and properties. J Biol Chem 1971;246:5739-48. Switzer RL, Sogin DC. Regulation and mechanism of phosphoribosylpyrophosphate synthetase. V. Inhibition by end products and regulation by adenosine diphosphate. J Biol Chem 1973;248:1063-73. Roth DG, Shelton E, Deuel TF. Purification and properties of phosphoribosyl pyrophosphate synthetase from rat liver. J Biol Chem 1974;249:291-6. Roth DG, Deuel TF. Stability and regulation of phosphoribosyl pyrophosphate synthetase from rat liver. J Biol Chem 1974;249:297-301. Gibson KJ, Schubert KR, Switzer RL. Binding of the substrates and the allosteric inhibitor adenosine 5'-diphosphate to phosphoribosylpyrophosphate synthetase from Salmonella typhimurium. J Biol Chem 1982;257:2391-6. Hove-Jensen B, Harlow KW, King CJ, Switzer RL. Phosphoribosylpyrophosphate synthetase of Escherichia coli. Properties of the purified enzyme and primary structure of the prs gene. J Biol Chem 1986;261:6765-71. Arnvig K, Hove-Jensen B, Switzer RL. Purification and properties of phosphoribosyldiphosphate synthetase from Bacillus subtilis. Eur J Biochem 1990;192:195-200. Krath BN, Eriksen TA, Poulsen TS, Hove-Jensen B. Cloning and sequencing of cDNAs specifying a novel class of phosphoribosyl diphosphate synthase in Arabidopsis thaliana. Biochim Biophys Acta 1999:1430:403-8. Krath BN, Hove-Jensen B. Class II recombinant phosphoribosyl diphosphate synthase from spinach. Phosphate independence and diphosphoryl donor specificity. J Biol Chem 2001;276:17851-6. Eriksen TA, Kadziola A, Bentsen AK, Harlow KW, Larsen S. Structural basis for the function ofBacillus subtilis phosphoribosyl-pyrophosphate synthetase. Nat Struct Biol 2000;7:303-8. Kadziola A, Jepsen CH, Johansson E, McGuire J, Larsen S, Hove-Jensen B. Novel class III phosphoribosyl diphosphate synthase structure and properties of the tetrameric, phosphate-activated, non-allosterically inhibited enzyme from Methanocaldococcus jannaschii. J Mol Biol 2005;354:815-28. Meyer LJ, Becker MA. Human erythrocyte phosphoribosylpyrophosphate synthetase. Dependence of activity on state of subunit association. J Biol Chem 1977;252:3919-25. Roessler BJ, Nosal JM, Smith PR, Heidler SA, Palella TD, Switzer RL, et al. Human X-linked phosphoribosylpyrophosphate synthetase superactivity is associated with distinct point mutations in the PRPS1 gene. J Biol Chem 1993; 268:26476-81. Roessler BJ, Palella TD, Heidler S, Becker MA. Identification of distinct PRPS1 mutations in two patients with X-linked phosphoribosylpyrophosphate synthetase superactivity. Clin Res 1991;39:267. Becker MA, Smith PR, Taylor W, Mustafi R, Switzer RL. The genetic and functional basis of purine nucleotide feedback-resistant phosphoribosylpyrophosphate synthetase superactivity. J Clin Invest 1995;96:2133-41. Gyongyan SA, Manucharyan TG, Danielyan KE, Kevorkyan GA, Chailyan SG. Xanthine oxidoreductase is a key enzyme of purine catabolism regulation. Electronic Journal of Natiral Science 2013;2:17-21. Danielyan KE. Dependence of Cells Survival from Xanthine Oxidase and Dihydopyrimidine Dehydrogenase Correlative Activities in Human Brain Derived Cell Culture. Central Nervous System Agents in Medicinal Chemistry 2013;13:108-13. Danielyan KE, Kevorkian GA. Xanthine oxidase activity regulates human embryonic brain cells growth. Biopolym Cell;27:350-3. Danielyan KE. New details regarding XOR as a part of the balanced oxidative and antioxidative systems. Biological Journal of Armenia 2014;LXVI:30-43. Litwack G, Bothwell JW, Williams JJ, Elvehjem CA. A colorimetric assay for xanthine oxidase in rat liver homogenates. J Biol Chem 1953;200:303-10. Belayev L, Saul I, Busto R, Danielyan K, Vigdorchik A, Khoutorova L, et al. Albumin treatment reduces neurological deficit and protects blood-brain barrier integrity after acute intracortical hematoma in the rat. Stroke 2005;36:326-31. Liu XZ, Xie D, Yuan HJ, de Brouwe AP, Christodoulou J, Yan D. Hearing loss and PRPS1 mutations: Wide spectrum of phenotypes and potential therapy. Int J Audiol 2013;52:23-8.